As businesses and marketers, we have a number of incredible ways to leverage the increase in mobile usage to our advantage, gaining more profit and engagement more efficiently. When you walk down the street, all you see if people glued to their phones. We spend an average of 2 hours and 51 minutes on their phones every day. This translates to about 86 hours every month. And believe it or not, one high-powered Facebook exec believes that we aren’t using our mobile devices often enough or efficiently enough. Facebook’s head of advertising Andrew Bosworth thinks that people should—and will—put more time and energy into their smart phones. Our mobile devices are capable of so much, even though most users rely on it primarily as a camera and a path to the internet. But mobile—and Facebook—could help people do so much more. Now from their Messenger app, users can order flower deliveries with just a few clicks, and schedule an uber quickly thanks to the app’s location awareness. These are real, valuable services that make our lives easier. An increased use in mobile can mean more personalization and automation simultaneously, creating a powerful combination that can make the mobile evolution on Facebook even more valuable. This, in turn, can mean more profits for Facebook. While this trend will only increase, the mobile evolution of Facebook has already begun. As businesses and marketers, we have a number of incredible ways to leverage the increase in mobile usage to our advantage, gaining more profit and engagement more efficiently. We all know that targeting is the biggest factor that makes Facebook Ads so effective. 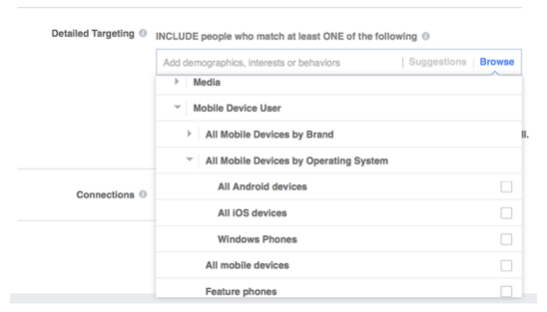 Now, we have plenty of targeting options that take mobile usage into consideration for a higher chance of conversions. When promoting your business’s app, for example, you should always use mobile targeting. Only show your ads to devices that your app works on. If it’s an iOS only app, for example, you should only target iPhones. If it only works on certain generations of iOS or Android, target those devices. This increases your overall relevancy, and thus your conversions (all while lowering your CPA). Tons of businesses use chatbots for their sites, but Facebook Messenger chatbots can revolutionize how you sell and provide customer service on Facebook. Chatbots allow your business’s account to respond almost instantly when a user messages you; this is a plus since many users are accustomed to a lightning-fast response. You can use chatbots to handle customer service issues, like retrieving customers’ tracking numbers for their orders and answering questions about the return policy. You can also use them to sell, like Domino’s does in the example below; it’s incredibly easy to order a pizza from Domino’s or a flower arrangement from 1-800 Flowers in just a few taps on the screen. This is a huge advantage; instead of needing a customer service person or salesperson to answer every single Facebook message, they may only need to answer about 5-10% of them instead. This can help you cut back on costs, retain more customers, and sell more all at once. 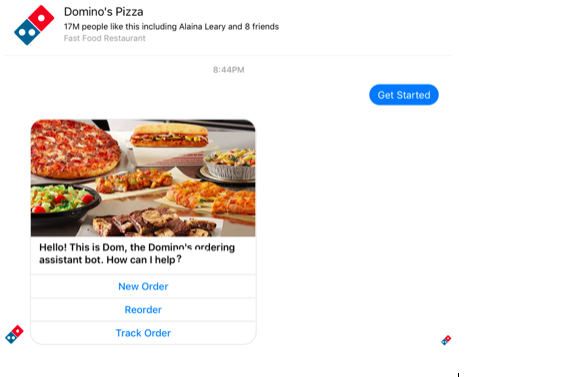 Facebook has two types of Messenger Ads, but for our purpose, we’re going to look at the ads that encourage users to contact the business by sending them a message through the Messenger App. This type of ad encourages an immediate response by generating conversation. If someone contacts you to ask a question about your product or service, you’ve been given an in. You can resolve any objectives and softly sell, explaining everything users need to know. While this is best done with an actual salesperson or customer service representative hanging out on the other side of the phone, you can automate this with a chatbot, too. Want to expand the benefits of Facebook Ads to additional platforms (even outside of Instagram)? That’s what Facebook’s Audience Network Ads do. 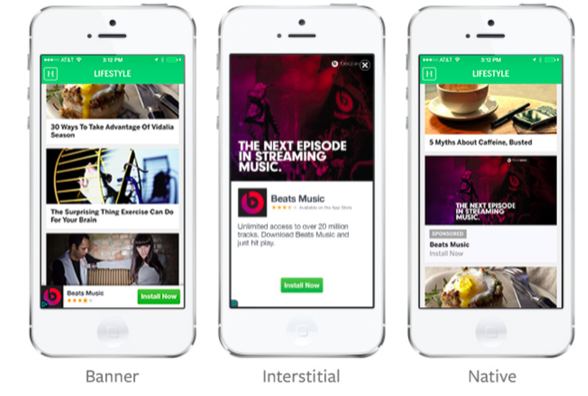 These ads will be displayed in mobile apps that belong within Facebook’s network. It works just like regular ads, with the same targeting options, and are run through the Ads Manager or Power Editor. They’ll be displayed in a format that feels native to the actual app they appear in. 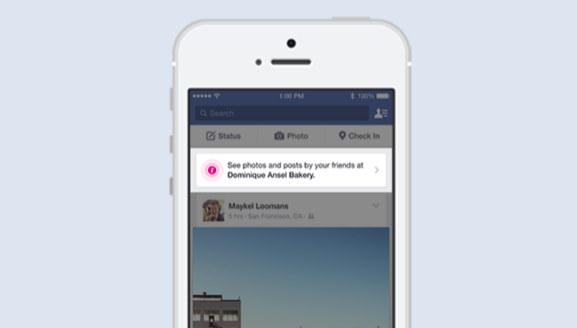 These ads provide another way to always reach your customers on mobile devices—even when they aren’t within Facebook. This could expand the reach and scale of your audience, helping you get more results quickly. Have you ever walked into a business only to have Facebook immediately show you information about the business? You might see that your friends have checked in, or be shown reviews that your friends have written. You could also see the top items on a menu or a welcome note that the business has written for you. These are Place Tips. Place Tips are only shown to users who have their location services turned on for the app, and they can be extremely helpful. Aside from a welcome message, which businesses can write, Place Tips are automatically personalized for each individual user who sees them. They see what Facebook thinks that they’d want to see, like their friends’ reviews. This helps you get more results in the process. Place Tips can tell users a lot about your business, right when they’re there and ready to engage. You can even send them messages about sales or special events that you have coming up, encouraging sales and future event attendance. It’s an incredible mobile feature that all businesses should take advantage of. With the development of technology accelerating at a rapid pace, we can offer so much to our customers just through Facebook. By using the mobile-centric features like chatbots and Messenger Ads, you can connect with your audience at every turn and make your brand more available to them. This immediate availability combined with the convenience of users having it all at their fingertips presents an incredible opportunity for businesses to rake in more profit than ever before. All you have to do is be ready for it.